Introduction by Carl Slaughter: Dreams, premonitions, discernment, instinct. Call it the mystical realm, the subconscious realm, the psychic realm. We’ve all tapped into it, some of us often, usually involuntarily. But our western philosophy tells us to draw conclusions based on physical experience or mental logic, so our culture has downgraded this aspect of our existence. Meanwhile, there are far too many fakes who claim to speak with the dead, bend spoons, or predict earthquakes. The result is that we have limited our understanding of reality. Neuroscientist Patrick Hemstreet delves into this aspect of human existence in his fiction writing and his nonfiction reading list. 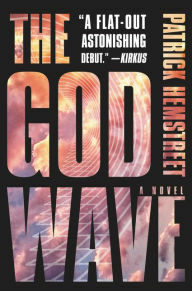 Hemstreet’s novel The God Wave will be released May 17, 2016 by Harper Voyager ($24.99 Hardcover). 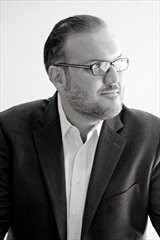 CARL SLAUGHTER: What does the title The God Wave refer to? Patrick Hemstreet. Photo by Tanya Radoff. PATRICK HEMSTREET: It refers to a new EEG pattern, a waveform. Currently we know of five EEG brain rhythms: Alpha, Beta, Theta, Delta, and Gamma. The new waveform, the titular “God Wave” refers to the emergence of a sixth EEG frequency that accompanies extraordinary abilities. It is also referred to as a Zeta Wave in the book. CS: How do the scientists in the story do to brains, enhance them with technology not available outside the lab or train them to access what’s already there? PH: Well that’s the rub, isn’t it? This question is explored over the course of the God Wave trilogy. I don’t want to give you a succinct answer now and spoil it for the readers. I will simply say that in my own personal philosophy, the mind in all of its permutations is more powerful than any technology in the universe. CS: Do the test subjects in the story need a certain type of brain or a certain type of a certain portion of their brain or a certain gene, or will any human brain suffice? PH: Any human brain will suffice, but more clarity is given in the sequel as to how these abilities are unlocked. Any human brain is capable of a Zeta Wave; it is simply a matter of how successfully and quickly it can be tapped into. CS: Is there anything a human CAN’T do using the God wave? PH: Yes, the ability is limited just as thoughts are limited. The human mind can visualize and create from an existing palate. This is to say that we have to work with what is already there; arranging existing matter, atoms. You can envision and manipulate anything that has a tangible reference; it is very hard to imagine anything else. I believe this is why when we try to picture our soul we generally think of it like a ghost image of our corporeal self. Our mind is incapable of conceiving of spiritual matter or ether, what is sometimes aptly referred to as Ein Soph, the unknowable. That is the limitation. CS: Do other humans have anything to fear from these test subjects? Does society have anything to fear about this scientific discovery? PH: Yes indeed, if the wrong people gain these abilities the results could be catastrophic. It would be as if all villains in the world were the only ones who could run while the rest of us were relegated to crawling. PH: Aha, you are on to something. Proving the mind exists is an impossibility, at least with physical means. How deep does the mind go? Does it exist on multiple levels or different planes as the mystics have said? Your question yields more questions…the sign of a great and tantalizing conundrum. Yes, the story does explore these concepts and uses them to propel the narrative in what you will see is a very unique manner. CS: One ARE reviewer, who reviewed the story at much longer than average length, said, “He offers adult consideration of diverse perspectives. I was particularly impressed with his dialectic on security versus openness. Considering that this is Hemstreet’s first novel, it is pretty impressive.” Please expound. PH: I don’t want to spoil the fun for my readers, but what I will say is that yes, there is a sinister presence. This “evil” element puts issues like security versus privacy at center stage. A challenge we grapple with in today’s world. CS: How similar or different is the story to “Lucy” and “Limitless”? PH: It is similar in the sense that all of these stories explore the potential of humanity. Anyone who has read Napoleon Hill, Wayne Dyer, or any variety of quantum physics materials wonders just how far and how much the mind can affect our world and our lives. In all three of these works that question is explored and suggestions offered. Perhaps we do dwell in an ocean of thoughts, each of us observing our world in one’s own unique way? One day could our minds have the ability to understand this and fundamentally change our lives and world view? I hope so. CS: Do you get that question a lot? PH: The parallels, yes; the question, no. So thank you for that! CS: How are you qualified to write about the science premise? I am also an armchair mystic having devoted a great deal of my adult life to the study of comparative religion and mysticism. CS: What was your inspiration for the science premise? PH: The melding of my two passions: applied neuroscience and mysticism. CS: What fiction and nonfiction material are you reading along the lines of the science premise? This is to name just a few, there are many more, but I’d hate to give you a grocery list. CS: Will there be a sequel? PH: Yes, this is a trilogy. This entry was posted in Like Show Business and tagged Carl Slaughter, Patrick Hemstreet by Mike Glyer. Bookmark the permalink. Well, of his “list”, one out of three ain’t bad. Twain always resonated with me. The other two—meh. As long as the God Wave allows me to annihilate my evil classmates at the senior prom, I’m for it.